When you are ready to spend some quality time outdoors, then choose this 1910ESP Rockwood Extreme Sports folding pop-up camper by Forest River! 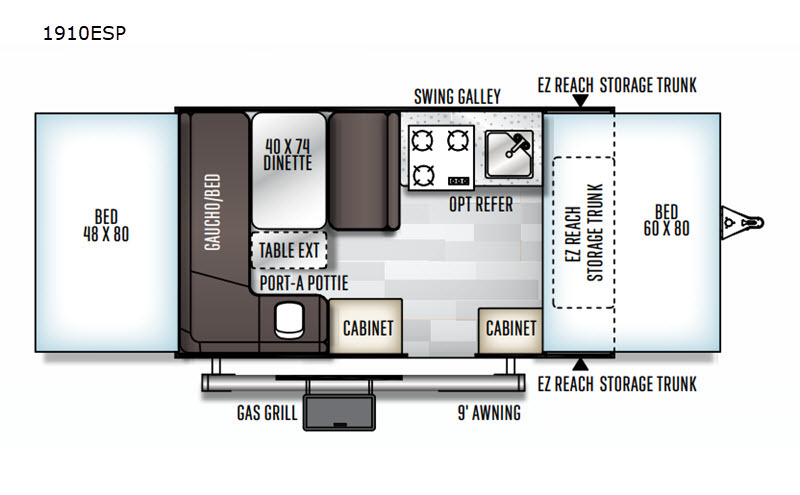 This model features a port-a-pottie, a rear bed that is 48" x 80" and a front queen bed. You can easily store your camping chairs or outdoor games inside the exterior EZ reach storage trunk. 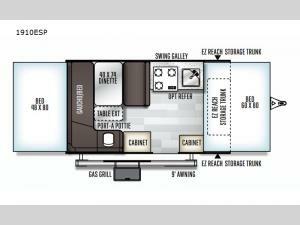 The chef of your group will enjoy preparing the meals either inside the kitchen or outdoors at the gas grill, plus there is a 9' awning to protect you from getting too much sun. After you have prepared your best meals, you can enjoy them at the booth dinette and even transform it into an extra sleeping space at night!